My son is a bag fan of Star Wars, probably because my husband is a fan and has shared those movies with my son. With the upcoming launch of the new movie later this year, my daughter is looking forward to watching all of the movies with my husband and son, as they 'count down' to the new movie. At our house, cereal is something that we enjoy on a regular basis. Not only is it our go to for breakfast most mornings, but we also have been known to enjoy a bowl of cereal for dinner and even as a snack. But, beyond that, I have several meals and snacks that I prepare using cereal as an ingredient. So, when General Mills reached out to share about how they have teamed up with Star Wars to offer vintage movie posters in specially marked boxes of Big G cereals, I was excited to have the opportunity to participate in the promotion. We received a box of Cinnamon Toast Crunch and Reese's Puffs. The next morning, shortly after arriving at work, I received a text from my son asking if they could open the new boxes of cereal. Of course, I told him he could and asked that he leave it on the counter, rather than putting it away. We lucked out and got two different posters - I was disappointed that they were from the 'newer' movies and not the original trilogy...maybe in the next box! Slice chicken breasts into long slices, like chicken fingers. Crush the cereal (or put through the food processor) and place in a baggie or on a plate. Combine egg and milk. Place flour in a baggie or on a plate. Season the chicken with salt and pepper. Preheat oil in skillet over medium high heat. Dredge each piece of chicken, first in the flour, then the egg mixture and then coat with cereal. Fry the chicken for about 4 minutes per side, being sure to cook through. We enjoyed this last week served with a mustard sauce and a side of oven baked potato wedges. The chicken has a nice caramelized, crunchy delivery - it is a kid favorite. Kix has been a favorite cereal for this recipe in the past, but I think that next time I will try it with Cinnamon Toast Crunch...I think the cinnamon would give it a nice flavor. General Mills is once again connecting fans with what they love. Hidden inside each box, you will find one of six timeless movie posters featuring your favorite Star Wars films. Star Wars and cereal fans alike can collect all six classic posters in each participating brand of General Mills cereals, including Cinnamon Toast Crunch, Honey Nut Cheerios, Trix, Cookie Crisp and Reese’s Puffs. The specially marked boxes of Big G cereals hit store shelves this month, for a limited time only. Check out the #CerealWars Tumblr page that launched this week for more fan fun surrounding the General Mills and Star Wars partnership. Courtesy of General Mills, one A Busy Mom of Two Reader will win 2 boxes of participating General Mills cereals and an exclusive Star Wars vintage movie poster. It is open to US only. Giveaway will remain open through May 10th and is open to residents of the US only. Winners will be selected through Rafflecopter. The winner will be contacted by e-mail and will have 24 hours to respond or a new winner will be selected. I am not sure which is my favorite, so I would have to say the return of the Jedi! I think it would be Return Of The Jedi or Revenge Of The Sith. I like Return of the Jedi. Empire Strikes Back is by far my favorite!! The very first original Star Wars is my fav. I liked the Empire Strikes Back with Revenge of the Sith a close second. It is to hard to choose just one I love them all. I love RETUNE OF THE JEDI! 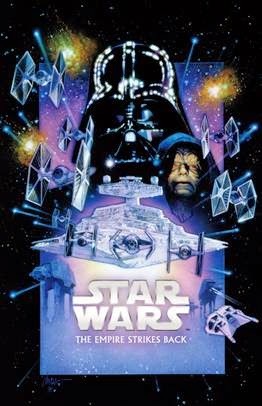 My favorite movie is: Star Wars: Episode V - The Empire Strikes Back. I liked the first Star Wars movie the best! Hans Solo was my favorite character. I love Return of the Jedi! The first one will always be my favorite because I was so young and unjaded when I saw it. Return of the Jedi is my favorite. I think Return of the Jedi is probably the best one! My favorite is Return of the Jedi. It's one of my favorite movies ever. I would say that Return of the Jedi is my favorite. My fiance keeps telling me I need to watch them, but I have never seen them. My favorite is The Empire Strikes Back, thanks!